You are here: Home / Kristallnacht evokes very clever program. 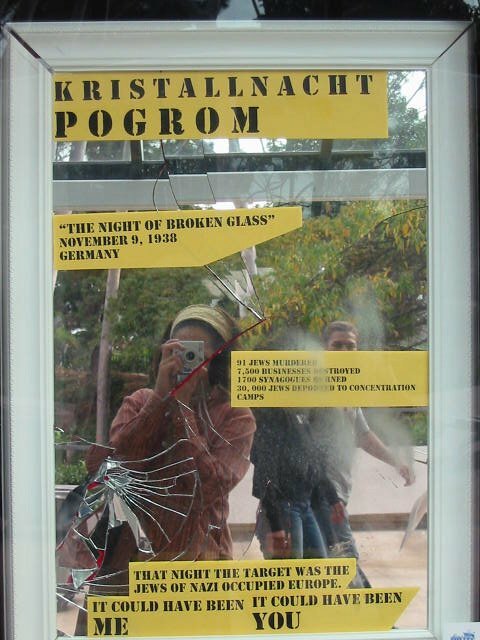 Kristallnacht evokes very clever program. Students in Cincinnati deserve a yashar koach! Students from the Cincinnati Hillel Jewish Student Center gave out pieces of broken glass Tuesday on McMicken Commons while the names of Holocaust victims were read.The broken glass is symbolic of Kristallnacht, translated as “the night of broken glass,” which was the first day of the Holocaust.Tuesday marks the 65th anniversary of that day.On Nov. 9, 1938 around 240 Jews were killed, and many Jewish homes, businesses and synagogues were destroyed.Students gave out a small flier with each piece of glass that reminds students about the atrocities of the Holocaust.”Remembering the past is a victory of the human spirit,” read the flier given out by students. Just one correcton, thousands of Jewish businesses and synagogues were destroyed and thousands killed and rounded up on that horrible and infamous day. http://rabbiyonah.com/wp-content/uploads/2013/04/cropped-RabbiYonahbookCover11.jpg 0 0 rabbiyonah http://rabbiyonah.com/wp-content/uploads/2013/04/cropped-RabbiYonahbookCover11.jpg rabbiyonah2005-11-10 13:34:002005-11-10 13:34:00Kristallnacht evokes very clever program. “Just” weeping… Perhaps a more active position is due.